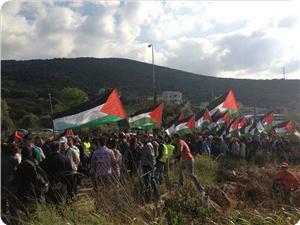 Dozens of Palestinian activists have protested on Thursday afternoon at Ma'ale Adumim settlement's entrance east of Jerusalem and tried to close the road leading to the outpost before being suppressed by Israeli soldiers. 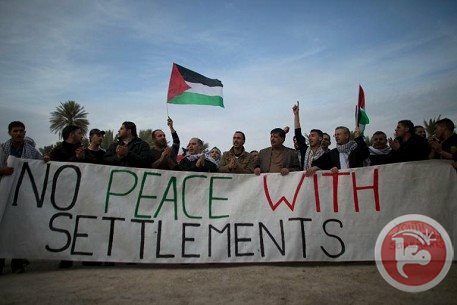 According to PIC reporter, Palestinian activists tried to close the road leading to Ma'ale Adumim settlement in order to prevent Jewish settlers from marching to Bab al-Shams village that is exposed to Israeli attempts to annex it to Jerusalem as part of an Israeli plan to divide the West Bank into two parts. The Israeli occupation forces (IOF) have suppressed and assaulted the Palestinian activists forcing them to withdraw to Azireya town. Earlier, the IOF had stormed Azireya town before the Palestinian protest started, and arrested activist Mahmoud Zawahr. 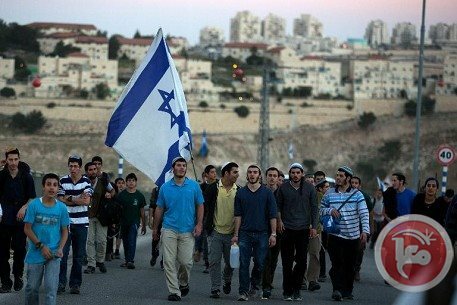 Thousands of Israeli settlers organized a rally in the area calling for annexing Bab al-Shams town and Ma'ale Adumim settlement to Jerusalem with the participation of Israeli ministers and MKs. For his part, Salah al-Khawaja, deputy secretary-eneral of the Palestinian national initiative, told the PIC that the Palestinian protest came as a response to Israeli settlers' policy and attempts to impose a fait accompli and to establish the largest settlement bloc in the region at the expense of Bab al-Shams village. Al-Khawaja stressed their determination to continue struggling against Israeli settlement schemes till ending the occupation. Thousands of young Israeli hardliners marched on Thursday to demand the government build new settler homes in E1, a highly sensitive strip of West Bank land near Jerusalem. Police said more than 6,000 people, including major Israeli political figures but composed mostly of teenagers, joined the march which began in Maale Adumim settlement in the occupied West Bank and ended at E1 -- an undeveloped stretch of land just to the west, which borders annexed East Jerusalem. "Kerry = persona non grata," read one of the signs, referring to US Secretary of State John Kerry, who is currently trying to coax Israel and the Palestinians towards a peace agreement. Israel has been planning construction in E1 since the early 1990s but nothing has ever been built there due to heavy international pressure. Plans for building 1,200 units unveiled in December 2012 were quickly put on the back burner after the announcement triggered a major diplomatic backlash. The Palestinians say construction in E1 would effectively cut the West Bank in two and prevent the creation of a contiguous Palestinian state. "We will keep (the) promise to build in E1," Housing Minister Uri Ariel told a crowd composed almost entirely of high-schoolers. Last April, Ariel, who belongs to the far-right national religious Jewish Home party, pledged to build new apartments in E1 within 18 months. The demonstration came hours after a Palestinian protest on the site in opposition to Israeli settlement construction in E1. That protest was held in anticipation of the Israeli right wing protest, and Israeli forces detained one activist during the demonstration. In January 2013, a group of more than 200 Palestinian activists had set up a protest encampment called Bab al-Shams in E1 as a way of drawing attention to Israel's plans to settle there. Israel and Palestinians began a nine-month track of direct peace talks at Kerry's urging in July 2013, but there has been little visible sign of progress. Kerry, who has repeatedly come under fire from Israeli hardliners in recent weeks, is currently focusing his efforts on hammering out a framework agreement which would allow for the talks to be extended, likely until the end of the year. In late 2012, the Israeli government announced plans to build hundreds of settler homes in the E1 corridor after Palestine was granted non-member observer state status at the United Nations. Those plans were later frozen, but never completely shelved. Israeli settlement construction in E1 would divide the West Bank in two and make the creation of a contiguous Palestinian state -- as envisaged by the internationally backed two-state solution to the Palestinian-Israeli conflict -- virtually impossible. Soon after the signing of the Wye River Agreement in 1998 Israel's minister of infrastructure in the first Netanyahu government, the late, unlamented Ariel Sharon, urged settlers to "seize the hilltops". What followed was an explosion of Israeli settlements across the occupied West Bank. Sixteen years on, as US Secretary of State John Kerry makes another push for an agreement on his peace plan, Israel has again ratcheted up its land-grabbing campaign. The political and humanitarian consequences are countless and far-reaching. Politically, Secretary Kerry's ambition to have a final agreement within nine months was, from the very beginning, unrealistic. Now in the wake of Israel's continued pillage of Palestinian land he is said to be considering a deferral until the end of 2014. Fixing ad hoc dates that are divorced from reality can, however, be dangerously deceptive and misleading. It is one thing to "mediate" from the comfort zone of a hotel in Jerusalem or an office in Ramallah; it is quite a different matter to experience first-hand what it means to be a Palestinian in a village wrecked by Israeli demolitions. 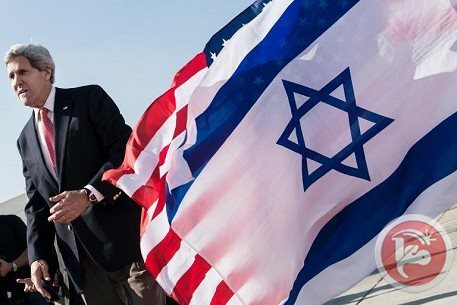 Thus, it seems quite reasonable that Mr Kerry should, on his next visit to the occupied territories, trek to the outskirts of Ramallah, Hebron and Bethlehem and witness for himself the damage done to Palestinian agricultural land by the settlers in their hideous race against the agreement clock. Such a direct encounter with the "facts on the ground" would, within minutes, confirm that peace cannot be imposed from above, especially in this poisoned climate. Indeed, in the same way that the secretary state had the vision to send his assistant, Victoria Nuland, to Kiev's Independence Square to show solidarity with protesters, he could also ask her to visit the occupied territories and accompany the US-made bulldozers as they wreak havoc and destruction in Palestinian villages. The obvious difference between the two scenarios is that whereas the protesters who brave the cold in Kiev chose to do so, the Palestinians who sleep out in parts of Jerusalem do not do so voluntarily. They were evicted forcibly from their homes. For the hundreds of victims who spent years working and saving to provide homes for their loved ones, the impact of their demolition in unimaginable. Spare a thought for their wellbeing and the future of their children. In many cases they have suffered multiple evictions and displacements. Inevitably, the convenient official explanation is always that the Palestinians had no licence to build or that the demolition was done to protect Israel's security and the security of its citizens. Of course, this systematic destruction of homes could not take place without the approval of the Israeli government and by association the indifference of the US. In 2013 there was a 127 per cent increase in the number of demolitions in the Jordan Valley compared to 2012 (from 172 demolished structures to 390); the Bedouin and herding communities in the Negev and Jordan Valley were the worst affected. Already, the pattern has continued into 2014 with demolitions taking place at an alarming rate in Al-Jiftlik Al-Mustafa (Jericho), Ein El-Hilweh in the northern Jordan Valley and Jabal Al-Mukabbir in Jerusalem. Like ostriches with their heads buried in the sand, none of the parties involved in the current "negotiations" are willing to admit that Israel does not recognise the Palestinian people or their rights. In fact, most members of the present Israeli government believe that all of the land, from the river to the sea, is the Land of Israel. Furthermore, they view the West Bank as a crucial source of water. 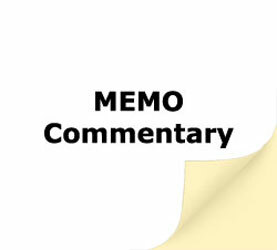 That is why, throughout all negotiations, including Camp David with the Egyptians, they have always insisted that no agreement should enable the Palestinians to dig wells in the western, northern and eastern slopes of the West Bank because it will impact negatively on the Israeli wells along the Green Line inside Israel. At present, Israel accesses 90 per cent of the water from the West Bank. Since the French Socialist Jean Glavany MP published his report on the theft of Palestinian water two years ago nothing has changed. If anything, they have got worse. Back then Glaveny pointed out that water had become "a weapon serving the new apartheid". To illustrate his view he noted that, "Some 450,000 Israeli settlers on the West Bank use more water than the 2.3 million Palestinians that live there." While in Israel the consumption is 266 litres per person per day, in the occupied territories the average is no more than 15 litres per person per day. Despite the reports in the Israeli media that Mr Kerry has accepted most of Netanyahu's demands, the latter is still stuck in the past, pursuing the same policy that he endorsed through Sharon in 1998. The proliferation of settlements and attendant destruction of Palestinian homes is simply his way for sabotaging Kerry's efforts. The latter must surely be asking himself: what do the Israelis really want? The truth is that many of them don't know themselves. What is well known, though, is that they don't want to withdraw from the land they acquired by force in 1967 and have occupied and colonised ever since. 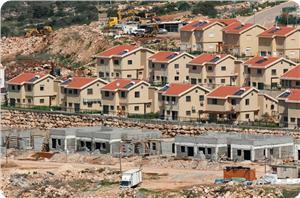 The settlements give the game away; Israel wants all of the West Bank. If Mahmoud Abbas hasn't smelt the coffee by now, he never will. Jerusalem's Israeli planning committee moved forwards on Wednesday with plans to build a nine-story Jewish seminary in the heart of a densely-populated Palestinian neighborhood near the Old City in occupied East Jerusalem. Plans for the new tower block, to be built in the Sheikh Jarrah neighborhood of East Jerusalem, were deposited for consultation, giving the public 60 days to submit any objections, settlement watchdog Peace Now said. "It's a plan for a nine-story, ultra-Orthodox yeshiva in Sheikh Jarrah which was deposited today for objections," spokesman Lior Amihai told AFP. "The plan was supposed to be discussed and approved a few weeks ago, however it was postponed -- most probably due to political reasons," he said. "It's not a game changer but it's on a piece of land in Sheikh Jarrah which has already suffered a lot. It's a very sensitive area and I think the prime minister knows it." Sheikh Jarrah is a Palestinian residential neighborhood located to the north of the Old City that has seen repeated attempts by Jewish settlers to evict local residents. The area, which is home to around 2,700 Palestinians, includes well-known landmarks, such as Orient House, the American Colony Hotel and the Palestinian National Theater, as well as many consular missions. Located on the road which links the Old City to Mount Scopus, the area is considered a strategic location and settlement groups have made persistent efforts to take control of its land. Israel occupied East Jerusalem during the Six-Day War of 1967 and later annexed it in a move never recognized by the international community. It considers all of Jerusalem its "eternal, indivisible" capital and does not see construction in the eastern sector as settlement building. The Palestinians want East Jerusalem as capital of their promised state, which is currently being discussed in US-led negotiations with Israel that are struggling to make headway ahead of an April deadline. Both the Palestinians and the international community consider all Israel construction on land seized in 1967 to be a violation of international law. Planning and Construction Committee of Jerusalem District on Wednesday approved a plan to build a religious school in the Sheikh Jarrah neighborhood in occupied east Jerusalem. The decision came in spite of the recommendations made by Civil Administration that the building would not serve the local population. Hebrew daily Haaretz reported that the building consists of nine above and three under-ground storeys, including a religious school, accommodation and other facilities. "The land earmarked for the building is a state property allocated by the Israel-controlled Jerusalem municipality for the school construction, although the place is structurally designed for the establishment a playground for educational institutions in the neighborhood." the daily said. Ahmad Sob-Laban, a Palestinian researcher in settlement activities in occupied Jerusalem, revealed an Israeli plan to expand Ma'ale Zeitim illegal settlement, built in Ras al-Amoud neighborhood in occupied Jerusalem. Sob-Laban said that Jerusalem City Council issued last month a permit for settlement construction in Ras al-Amoud neighborhood in order to establish pools dedicated to religious settlers. The pools are known as Mikveh, and are used for ritual immersion in Judaism. The settlement plan is intended to be implemented on nearly two dunums south of the settlement, overlooking Wadi Qaddoum road in total disregard to Jerusalemites' right in the area, he added. The plan includes a 400-square-meter building containing three separate pools dedicated to religious settlers and will be surrounded by a three-meter wall. The Israeli occupation authorities (IOA) are planning to expand a settlement built on the lands of Beit Hanina in the occupied city of Jerusalem, by constructing 22 new settlement units. 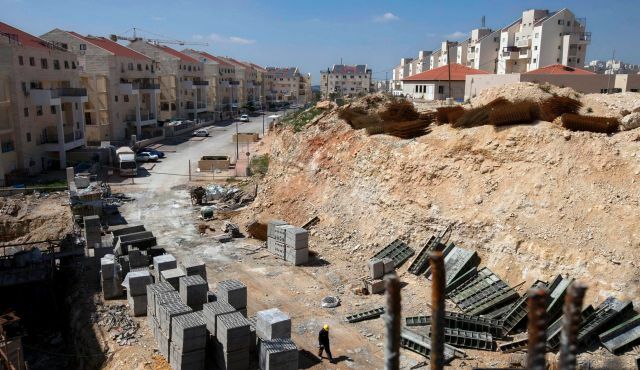 The Hebrew weekly Yorshalim newspaper reported on Friday that Israeli investors are preparing a plan to establish the 22 new residential units in the settlement of Beit Hanina, after seizing three Palestinian buildings in the town. Meanwhile, the Israeli Land Fund (ILF) intends to start new settlement constructions in the area of Kafr Aqeb to the north of occupied Jerusalem, near the apartheid wall. The ILF has signed several weeks ago on a deal to buy five dunums in Kafr Aqeb, near the apartheid wall, on which it intends to establish a residential project and sell houses at very low prices. 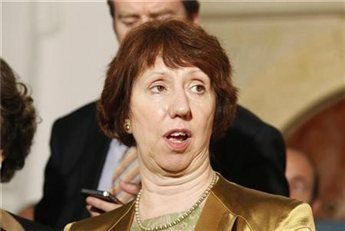 European Union foreign policy chief Catherine Ashton on Thursday expressed "deep concern" at Israel's recent decision to build 558 new settler homes in East Jerusalem. "These plans could put at risk the prospects of Jerusalem becoming the capital of two states and, in particular, the territorial contiguity between East Jerusalem and the southern West Bank," a statement released by her office read. The statement urged "Israeli authorities to reconsider their plans and to reverse their decision," stressing that they jeopardized the possibility of a two-state solution with Jerusalem as a capital for both states. Israel announced the decision to build the new homes on Wednesday, and they are located in various Israeli settlements in East Jerusalem. Currently, 200,000 Jewish settlers live in settlements across East Jerusalem, which was unilaterally annexed in 1980 in contradiction of international law. 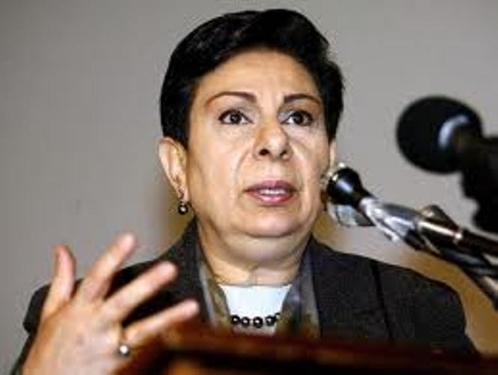 PLO Executive Committee member, Dr. Hanan Ashrawi Wednesday condemned Israel's latest approval of the construction of 349 settlement units in Occupied Jerusalem and the demolition of Palestinian homes in Beit Hanina and Sur Bahir. "It is evident that Israel is isolating Jerusalem from its Palestinian environment by means of apartheid walls, checkpoints and rings of settlements. The Palestinian citizens of Jerusalem continue to suffer at the expense of Israel's policies of ethnic cleansing which include home demolitions, annexation of Palestinian land, and the revocation of Jerusalem IDs," said Ashrawi. Ashrawi added, "Israel is engaging in the deliberate provocation of the Palestinians to drive them to leave the negotiations in protest of Israeli violations, and therefore be blamed for the destruction of the peace process." "Clearly, it is Israel and its violations of international and humanitarian law that constitute an Israeli attempt to ensure the failure of negotiations and the destruction of the two-state solution. 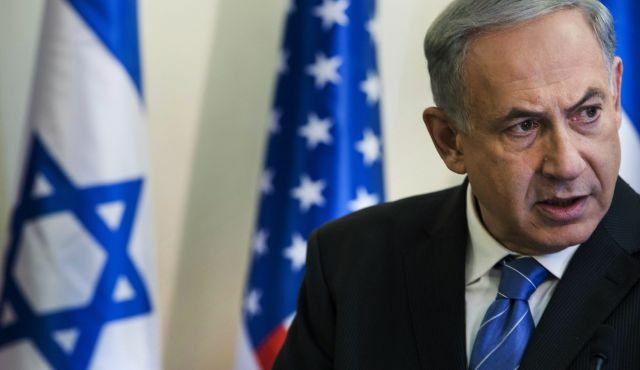 Israeli Prime Minister, Benjamin Netanyahu, is deliberately sending a strong message to the United States, Europe and the rest of the world that it has no intention of adhering to international law and the will of the international community," she elaborated. "Israel is not only capable of sabotaging the talks, but it is flagrantly destroying the chances of peace and stability throughout the region," concluded Ashrawi. A top American Jewish leader has voiced concern about a growing international campaign to boycott Israel over its settlement activities. Malcolm Hoenlein has called on Western governments to combat the phenomenon which he referred to as one of the greatest challenges facing Israel. In recent months, a growing number of European businesses and pension funds have dropped investments or limited trade with Israeli firms involved in settlement activities on occupied Palestinian land. There's also a parallel movement to boycott Israel's academic institutions and figures over the issue. Israel's settlement activities have been constantly growing despite the fact that they're considered illegal according to every reading of international law, including the Geneva Conventions which explicitly forbid construction on occupied lands. Israel on Wednesday pushed forward with plans to build more than 550 new homes in illegal settlements in annexed East Jerusalem, the city council said. In a statement listing "building permits that were approved" during a local planning committee session, it said permits were granted to private contractors to build 386 units in Har Homa, 136 units in Neve Yaakov and 36 units in Pisgat Zeev. Issuing construction permits is one of the last stages before construction begins, with building likely to start in the coming weeks, Israel's Peace Now settlement watchdog said. Israel and the Palestinians began a round of direct peace talks at the end of July with the aim of reaching an agreement within nine months. But the US-led negotiations have been overshadowed by Israel's refusal to rein in construction plans on occupied Palestinian land. Israel captured East Jerusalem during the 1967 Six-Day War and later annexed it in a move never recognised by the international community. It considers all of Jerusalem its "eternal, undivided" capital and does not see construction in the eastern sector as settlement building. 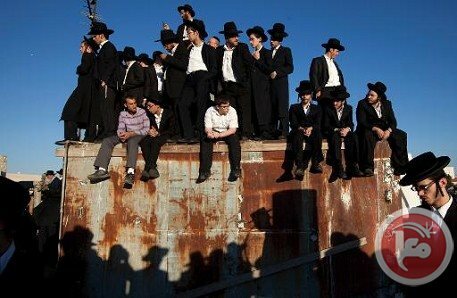 Some 350,000 Jewish settlers live in West Bank settlements, in addition to another 200,000 Israelis settled in occupied and annexed East Jerusalem. The international community views all settlement building on occupied Palestinian land as illegal. Israel and Washington were at loggerheads on Sunday after senior Israeli figures attacked US Secretary of State John Kerry for warning of a growing boycott threat if peace talks fail. The latest spat erupted a day after Kerry warned of the potential economic impact on Israel if the US-brokered negotiations with the Palestinians collapsed, in which he made reference to "talk of boycotts." His remarks sparked several outspoken reactions from senior cabinet ministers in Israel, which prompted an unusually pointed response from the US State Department urging Kerry's critics to get their facts straight. "For Israel there’s an increasing de-legitimisation campaign that has been building up. People are very sensitive to it. There are talk of boycotts and other kinds of things," the US diplomat warned at a security conference in Munich on Saturday. His remarks quickly came under attack by a series of hardline Israeli ministers, one describing them as "offensive" and another accusing the US diplomat of working "to amplify" the boycott threat. And even Israeli Prime Minister Benjamin Netanyahu told the cabinet that "attempts to impose a boycott on the State of Israel are immoral and unjust." "Moreover, they will not achieve their goal." But US State Department spokeswoman Jen Psaki hit back at Kerry's critics. Kerry, she said, had demonstrated steadfast support of Israel for over 30 years, "including staunch opposition to boycotts" and his remarks in Munich had merely "described some well-known and previously stated facts about what is at stake for both sides if this process fails, including the consequences for the Palestinians." "His only reference to a boycott was a description of actions undertaken by others that he has always opposed," she said. "Secretary Kerry has always expected opposition and difficult moments in the process, but he also expects all parties to accurately portray his record and statements." Earlier, Intelligence Minister Yuval Steinitz lashed out at Kerry in remarks carried by Israel's army radio. "What Kerry said is offensive, unfair and intolerable," he said. "You can't expect Israel to negotiate with a gun at its head while it discusses issues critical to its diplomatic and security interests." And Economy Minister Naftali Bennett of the far-right Jewish Home party, which is part of the ruling coalition but against territorial concessions to Palestinians, accused Kerry of taking sides against Israel. "There is no nation that would give its country up over economic threats, and neither will we," he said in a statement issued late on Saturday. "We expect our friends in the world to stand by our side in the face of the anti-Semitic boycott attempts, not amplify them." A growing number of governments and businesses have recently said they will not trade with Israeli firms with ties to illegal Jewish settlements, highlighting the creeping success of a Palestinian-led boycott campaign. The BDS movement -- boycott, divestment and sanctions -- works to convince governments, businesses and celebrities to cut ties with Israeli companies active in the occupied Palestinian territories, in a bid to repeat the success of the boycott which ended apartheid in South Africa. Last week, US actress Scarlett Johansson was forced to choose between being an ambassador for Oxfam and taking on a new role as the public face of Israel's SodaStream, which has a factory in the occupied West Bank, after the international aid group said the two roles were "incompatible." She resigned her position at Oxfam. On the same day, Norway's sovereign wealth fund blacklisted two Israeli companies involved in construction in annexed East Jerusalem. Since January 1, the European Union has blocked all grants and funding to Israeli entities operating beyond the pre-1967 war lines, sparking growing alarm in Israel. Kerry coaxed Israel and the Palestinians back to the negotiating table in late July 2013 for nine months of direct talks which will end in April. Israeli Finance Minister Yair Lapid has decided to suspend the transfer of public funds to West Bank settlements pending a probe into their alleged misuse, his office said. The move announced late Saturday was not expected to affect controversial plans for settlement expansion, a major obstacle to US-backed peace talks relaunched last year. Lapid's move came after it emerged that some funds earmarked for compensating West Bank communities were transferred to the settlement leadership for political activity, a ministry statement late Saturday said. West Bank settlements receive compensation following the 10-month construction freeze of 2009-2010, which came as part of US-led peace efforts. The funds were intended for security and the maintenance of schools and kindergartens. But after it emerged the funds were "allegedly being illegally channeled to the Yesha Council, which was using the money for political activities -- including against the government -- the minister ordered to immediately cut the future fundings under this clause," the statement read. The minister has ordered an investigation into the matter, it added. A spokeswoman for Lapid told AFP that during the week-long probe no government monies would be transferred to settlements. According to the Israeli anti-settlement think-tank Molad, the government has already transferred 148 million shekels ($42 million) to West Bank settlements as compensation to make up for property taxes not collected on structures not built. 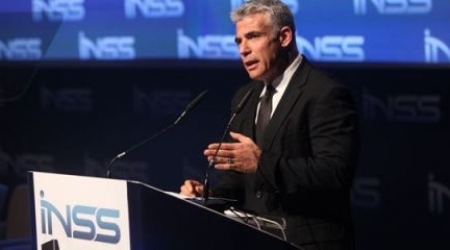 Lapid's decision comes as Israel grapples with an international campaign to boycott settlements, which are considered illegal under international law. US actress Scarlett Johansson on Thursday stepped down as ambassador for British NGO Oxfam after it had criticized her for promoting the Israeli firm SodaStream, which has a factory in a settlement east of Jerusalem. Boycotts of Israel entrench Palestinians in their rejectionist stance and push peace away, PM says at weekly Cabinet meeting. Prime Minister Benjamin Netanyahu rejected the warnings by U.S. Secretary of State John Kerry regarding the danger of the boycott movement gaining strength against Israel. "The attempts to boycott Israel are unethical and unjustified," Netanyahu said at the beginning of the weekly cabinet meeting on Sunday. "Moreover, they won't achieve their goal." "There are talk of boycotts and other kinds of things," said Kerry at the Munich Security Conference on Saturday. "Are we all going to be better with all of that?" Netanyahu remarked that the boycott efforts "cause the Palestinians to dig into their rejectionist stance and push peace away." According to Netanyahu, "No pressure will make me yield on the vital interests of Israel, security being at the forefront." Yuval Steinitz, the Minister of Intelligence and Strategic Affairs, struck even harder at the American secretary of state. "Kerry's speech about the boycott against Israel is harmful and insufferable … it's impossible to force us to negotiation with a gun to the temple," he said at the meeting Sunday. 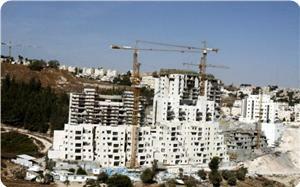 Construction site in the West Bank settlement of Modiin Illit. Danske Bank states that Bank Hapoalim is acting against the rules of international humanitarian law. The bank has already pulled investments from two Israeli firms. Israeli daily Haaretz reports that Denmark's largest bank has decided to pull its investments in Bank Hapoalim because of its involvement in the funding of settlement construction. Approximately a week ago, the Netherlands' largest pension fund management company, PGGM, decided to withdraw all of its investments from Israel’s five largest banks because they have branches in the West Bank and/or are involved in financing construction in the settlements. Danske Bank states Bank Hapoalim is acting against the rules of international humanitarian law; bank already pulled investments from two Israeli firms. Denmark's largest bank decided to blacklist Bank Hapoalim because of its involvement in the funding of settlement construction. Danske Bank added Bank Hapoalim to its list of companies in which the company cannot invest due to its corporate accountability rules. In an announcement posted on its website, the bank stated that Bank Hapoalim was acting against the rules of international humanitarian law. Israeli website Walla reported on the Danish bank's decision earlier on Saturday. The Danish bank had already decided to pull its investments from Africa Israel Investments Ltd. and Danya Cebus due to their involvement in settlements construction. Approximately a week ago, the Netherlands' largest pension fund management company, PGGM, decided to withdraw all its investments from Israel’s five largest banks because they have branches in the West Bank and/or are involved in financing construction in the settlements. Earlier this week, The Norwegian Ministry of Finance announced it has decided to exclude Israeli firms Africa Israel Investments and Danya Cebus from its Government Pension Fund Global. 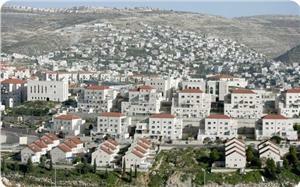 According to the announcement, the Ministry of Finance received a recommendation on November 1 from the Council of Ethics to exclude the two companies from the fund "due to contribution to serious violations of individual rights in war or conflict through the construction of settlements in East Jerusalem." Israeli Occupation Authorities (IOA) declared the establishment of more than one hundred housing units in Givat Ze'ev settlement and 1,800 new housing units at the expense of Sur Baher lands, Hebrew media sources revealed. Urshalim Hebrew newspaper reported that a new tender has been approved to establish 102 housing units in Givat Ze'ev settlement, north of occupied Jerusalem. The land dedicated for project is estimated at 12 dunums, the newspaper added, noting that the company that won the tender is going to pay 41 million shekels including 8.27 million for land development costs. Urshalim also pointed out that 1,800 new housing units have been approved to be built in Sour Bahr and Arnona neighborhood. For its part, Kol Ha'ir Hebrew paper stated that these new settlement projects have been submitted by Israel Lands Administration and supported by Israeli local and district committees, saying that the settlement plans came in light of Jerusalem mayor Nir Barkat's efforts to expand and increase housing units in occupied Jerusalem. The chairman of the municipality supervisory committee and member of the local committee (Meretz) said that most of the planned housing units are located in Jerusalem municipality, while the rest is located at Kibbutz Rachel and Sur Baher lands, noting that they cannot be approved unilaterally in light of the ongoing talks between Israeli and Palestinian authorities. Israeli War Minister Moshe Yaalon decided to legalize Gilead random settlement in return for the evacuation of four buildings erected in area B.
Haaretz Newspaper said that the settlement includes 40 buildings established in 2002, and it was evacuated by force twice.